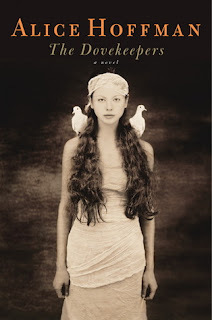 Reading The Dovekeepers by Alice Hoffman is a bit like seeing Titanic for the first time. There's no getting around the ship is going down, but who, if anyone, is going to survive? History tells us that Masada is a done deal. Rather than be enslaved by the Romans, the inhabitants of this Jewish fortress in the desert committed mass suicide. Fun times. Hoffman never lets us forget that bad things are a-coming. There is no dancing in steerage for our heroines. It's suffering right from the get go. Yael has a hateful neglectful father, who never misses an opportunity to remind her that she murdered her mother- by being born. She's got all the confidence of a beaten down dog. If you've murdered your Mom, where do you go from there? When they have to leave Jerusalem in a hurry, they end up hiding in the desert before making their way to Masada. Yael is assigned a job in the dovecotes with a group of women: Revka, caregiver to her daughter's two boys; Shirah, the Witch of Moab, and her two daughters Aziza and Nahara. She thinks her secrets are the Worst Things Ever but as we find out, these woman all have their own, some heartbreaking, some surprising. As they recount their terrible histories, they experience the events leading up to the fall of Masada. I didn't think much of Yael at the beginning, and she's my least favorite of the women in The Dovekeepers. Yes, she's had a tough life and her father isn't going to win Father of the Year but her rationalizing drove me nuts. She has a friend, her only friend, but she sleeps with this friend's husband (this isn't too spoilery since it happens in the first 50 pages). She feels guilty about it, yet she does it anyway. It was her destiny or written in the stars or whatever. This is the excuse of a lot of the things the women do: God put me on this path, who am I to change it? Yael thinks everything is a bad omen. Even if other people see something as a good omen, she's right there to say, "I knew it was a bad omen." Maybe you make your own bad luck, yes? Then there's Shirah, the woman everyone believes is a witch because she follows the tenets of a now outlawed branch of Judaism. She does practice a kind of magic, spells, cures, etc. Sometimes it's very woo-woo and at one point, Shirah is trying to exorcise a demon, which should have been Serious Business but I thought it funny. She pretty much just bullied a women into a Law & Order-esque confession. She also suffers from "it was written in the stars" syndrome when it comes to men. Aziza is the most fascinating character, which was surprising. I can't say much about because the surprise is the best part. I will say that I enjoyed her story because it is so different from the other women. I found it sad, however. Since she is the child of Shirah, her fate is in her mother's hands and lives at her whim. If given the choice, would she have had a different life? I didn't want Aziza's story to end when it did. There were things that bothered me but loved the historical aspect of the story. Even though it's over 500 pages, I read it in a couple of days. It's so compelling. For the most part I loved the writing. There were times when I thought it was a bit much. It is a brutal story. Awful things happen and those Romans are not even human. I can't imagine the brutality. I came away thinking of the waste of it all. So, it's not a happy book but it is fascinating. If you don't love all the characters, you'll at least love a couple. Even though it wasn't always easy to read these terrible things, I'm glad to have read The Dovekeepers. Thanks to Simon and Schuster Canada for the review copy. I want to read this one but I keep avoiding it because it sounds depressing. I have to be in the mood for that and it appears I'm just not at the moment. I will keep it on the list though. Yeah, I had to psyche myself up for it. The historical part was why I kept reading. Hoffman has been hit or miss for me, but this one did look interesting. Your review has given me a better idea what to expect. It does sound like a downer, but good characters can definitely redeem that. The only thing I've even read of hers was Practical Magic. I might give her a go again. I don't think I've read a Hoffman book before and that cover turns me off. I do like character studies though. Have this lined up in my ereader and actually didn't bother to find out what it was about. Now I have a better idea - it actually sounds quite interesting. I have this one and have somehow been avoiding it. I do like dark books though, so maybe I should finally give it a go. Thanks! I took me awhile to work up the nerve to read it. I knew it wasn't going to be a happy book. I am curious about this book. I will probably read it at some point. I know what you mean about some of the characters being hard to like, but I, too, wanted to find out what happened, and how things interconnected. It's definitely a worthwhile read. If you haven't checked out the photographs at the author's website, they're worth a look: haunting!